Peel and chop potatoes and boil in lightly salted water. 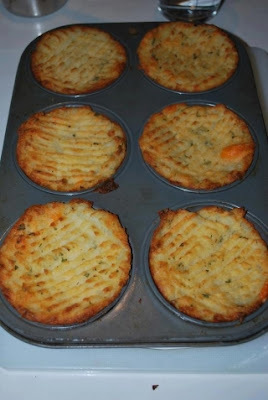 When soft, mash potatoes plain with butter or add ingredients like cooked bacon, cheese, parsley, green onion, garlic, etc. Run a fork along the top and brush with melted butter or olive oil. Bake at 375 degrees or until tops are crispy and golden.